Create your personal World-Travel-Map for free! 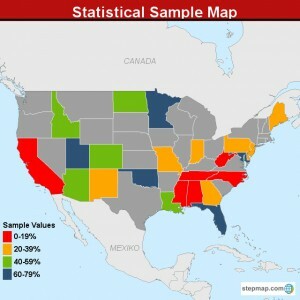 You all know how easy it is to create a personalized Map with StepMap but we took it one step further and made it even easier. 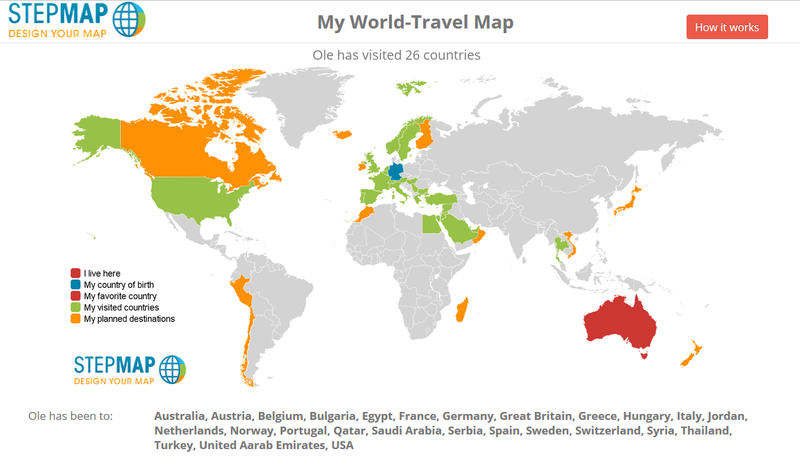 We have developed an exciting new Tool that allows you to create your own World-Travel-Map. 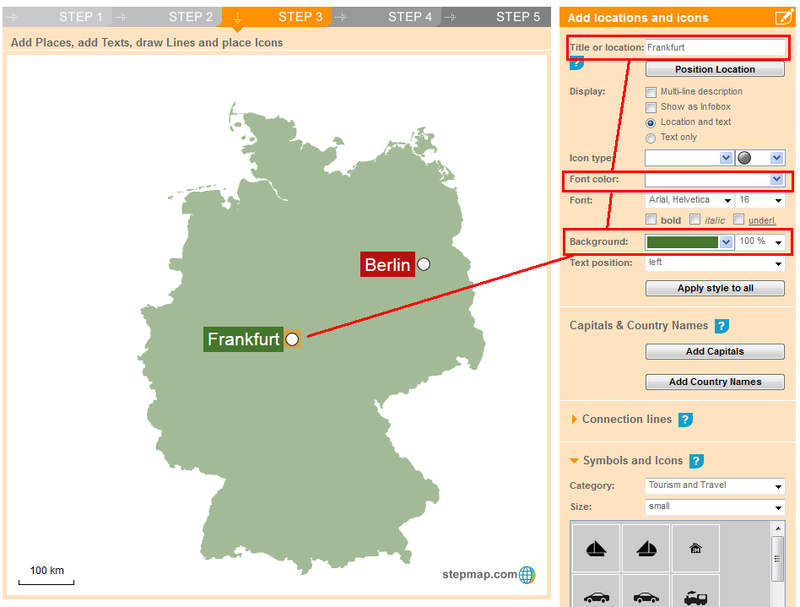 You don’t need to sign up – simply go to http://travelmap.stepmap.com and create your Map for free. 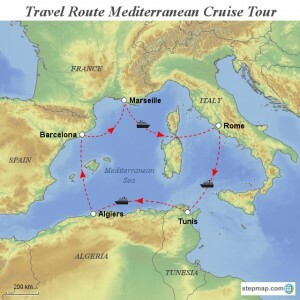 You can then share your Map with friends via Facebook, Twitter, Google+ or Pinterest. Or you can embed your Map on your website or blog. Also available is the option to download the Map in high resolution as an image file. That way you can also print it and use it in a photo book or a poster or presentation. The high resolution download normally costs US$ 4.99 but the first 50 users who create their Map and use the voucher XMAS2015 can download it for free. So be quick :). Oh… and because it is Christmas soon I will top that by saying whoever creates a Map and shares it on their Facebook or Twitter page will receive high resolution version of their Map for free. 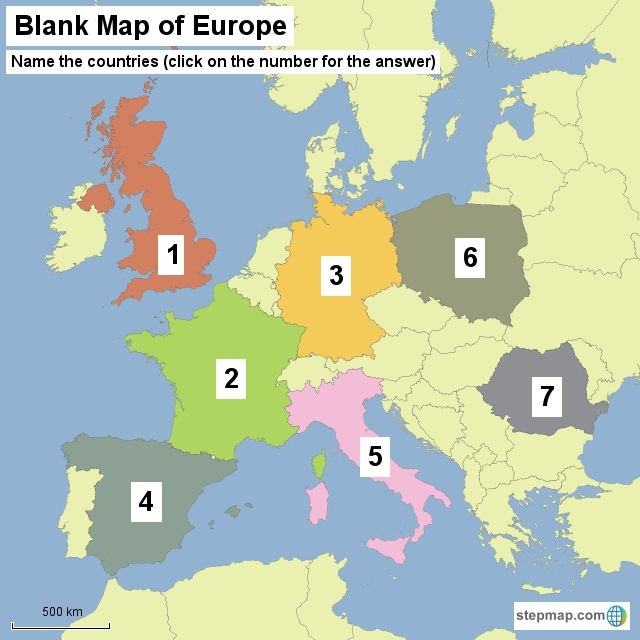 Simply email me at ole@stepmap.com once you have created and shared your Map. Now, get started and create your own World-Travel-Map at http://travelmap.stepmap.com and show the world where you have travelled to (and where you still want to travel to). Here’s my personal World-Travel-Map (which I will update soon after visiting more countries hopefully!). Click on it to enlarge. StepMap wishes you a merry Christmas! We wish you a merry Christmas and a happy new year 2014. There are a few more days left but as always the past year flew by too fast. As most of you probably know we are a small team from Berlin, Germany. Back in 2009 we launched the German version of StepMap. The Englisch one was launched not too long ago, in January 2013. So really, within a short span it has grown to a substantial size, almost overtaking the German site in terms of “Maps created per day”. We have been overwhelmed (in a positive way) with your feedback. Please continue writing to us – be it with questions, suggestions or ideas on how to improve the Map tool. We really read every single email and take notes of all ideas. 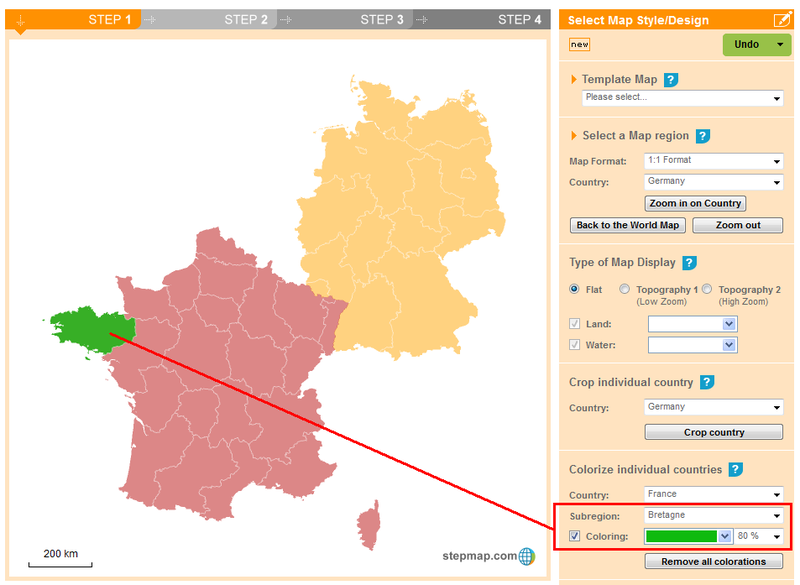 Since we do have quite a lot of users from France and Canada we decided to launch a French version of StepMap. It went online today – here it is: www.stepmap.fr is now online. Bonjour! Wishing you all a merry Christmas and a happy, exciting and great new year 2014. Quite often we are asked if and how one can create a Map Key (Map Legend) when using our Map Editor. It’s actually quite easy once you know how it’s done. So here we go. 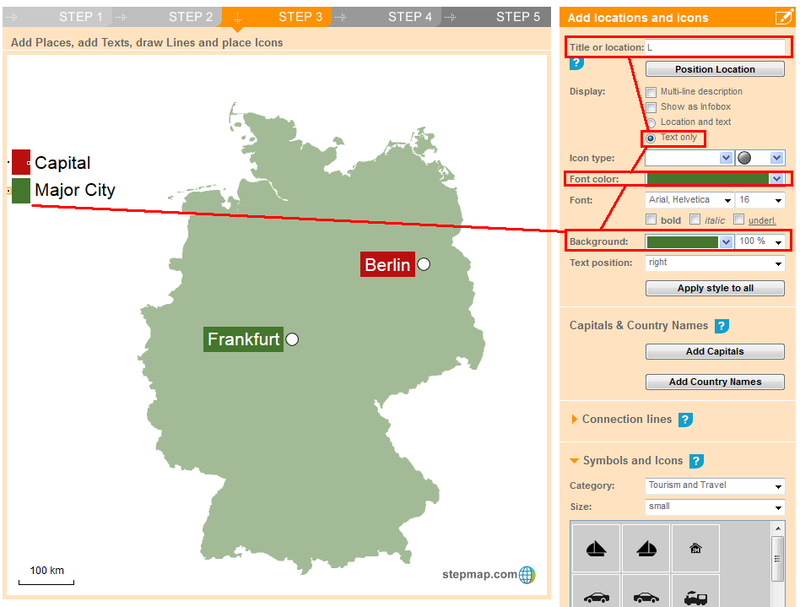 In Step 3 (where you can add locations, titles, lines and symbols) you start by adding things to the Map, e.g. a city or a symbol or some text. So you would start with a simple Map like this (see below) where you add three locations with three different colour markers (icons). Then you simply add three more markers (icons) to the Map and move them to one side of the Map (see below). Those you simply name e.g. Capital, Major City, Small Town. Of course, you can replace the cities with anything you want to display on the Map and of course you can use anything you like for the actual Map Key. The basic idea is that you use the same symbols and colours for the same group of elements. Alternatively, you can use the same symbol for all elements on the Map (see below) but use different colours for the actual text. It’s a little bit more tricky now. You click anywhere in the Map and write a single letter (e.g. “L” in the screenshot below). For that letter you choose “Text only” and the use the same font colour as the background colour. Then you click next to the green square marker and write (e.g. “Major City”). Remember to choose a black font and transparent background then (or anything that makes sense other than same colour for font and background). You have asked for it – now it’s done. If you want to crop (or highlight) a certain country and remove everything else around it, there is now a simple way to do so. 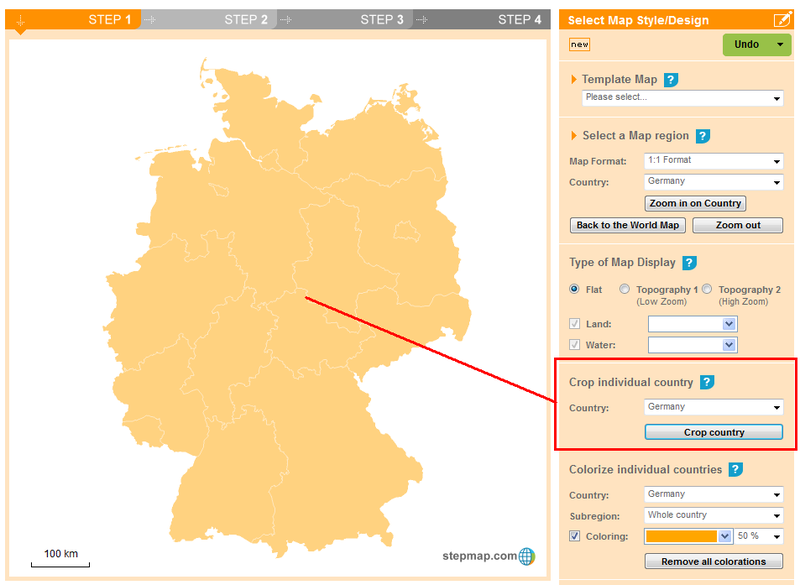 In Step 1 of the Editor simply click on “Crop Country” (in the middle of the right navigationl panel) after you have selected a country from the drop down menu above. You will see the country with its regional borders (in the screenshot above Germany with “Bundesländer” (states)). Of course, you can further edit the Map, e.g. change the color of the highlighted country or add additional elements. 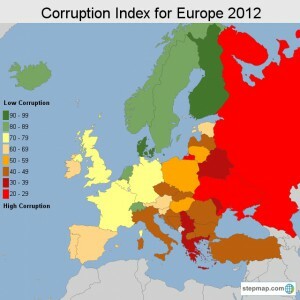 If you want to you can add another country with the same features (highlighted), see below. You can go even further and select sub-regions, e.g. “Bretagne” for France as in the following screenshot. 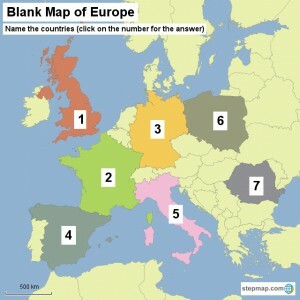 So Step 1 allows you to crop, highlight or colorize regions, countries and sub-regions. Many of you have asked for it – we listended and developed the new “undo” feature for Step 1 of the Map Editor. From now on you can undo everything that you did in Step 1, from an accidental zoom to a wrong color to other details. As you know Step 1 refers to all the main changes in regard to the Map area (level of detail, colors, zoom level, format, highlighting certain regions etc.) and thus is an essential part of creating and customizing your Map. The new “undo” feature can be found at the very top of the right navigation bar in Step 1. When you haven’t made any changes to the Map the button will appear in a grey color. Once you have made one or more changes it will switch to green. You can click on it to open a drop down menu with all the steps that can be made undone. (Note: We know that the “undo” feature is usefull for Step 2 as well so we are working on that right now). 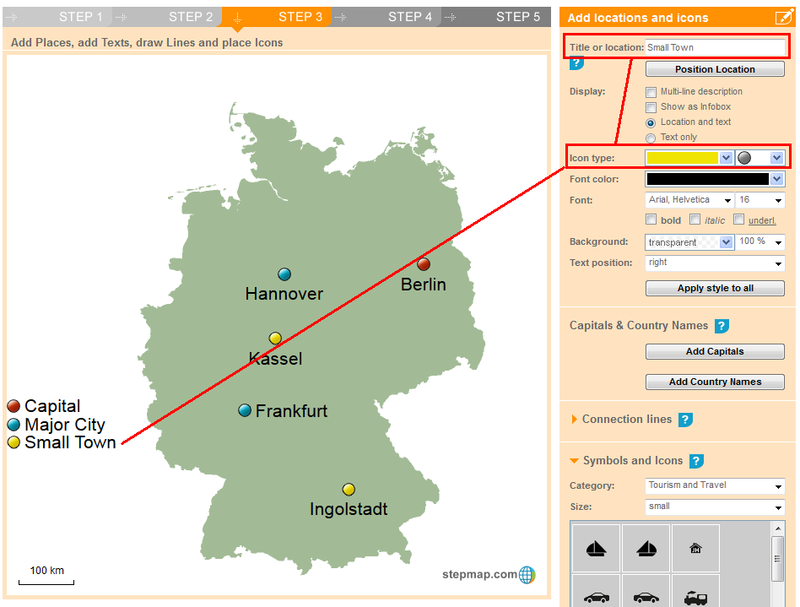 roughly 6 weeks ago we launched the new English version of StepMap. Since then we have seen a massive increase in signups and new Maps. We are quite excited to see that the number and type of Maps have gone up by quite a lot. Here are a few examples of Maps by our users – maybe they inspire you to create Maps for similar use cases. However, if you still have questions or need help please feel free to contact us directly at info@stepmap.com. Yes, it’s a general Email address but rest assured it will be read the same day – and we reply to all Emails. We hope you enjoy creating Maps with StepMap! Miltos on StepMap wishes you a merry Christmas! Louise Thériault on StepMap wishes you a merry Christmas!